Extend the reach and visibility of your research by creating a video abstract or video byte. 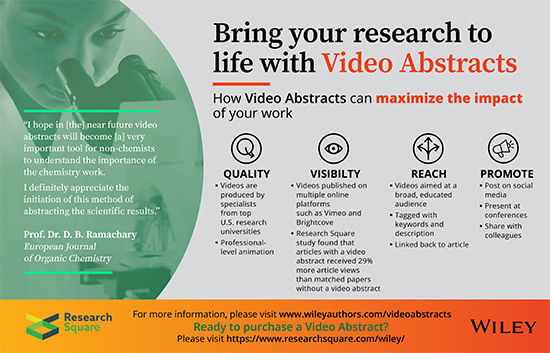 For a fee, Wiley—in partnership with Research Square—offers you the opportunity to outline the key findings of your published article in a dynamic video. Through this multimedia content, colleagues, funders and anyone else interested in your work can experience your research anytime, anywhere. What are video abstracts and video bytes? A 2-3 minute animation briefly explaining your methods and findings and the contribution of your research to the field, geared toward a broad, scientifically literate audience. Watch the video and view the flyer below to learn more about how video abstracts can help you to maximise the impact of your research. How do I order a video abstract or video byte? Who creates my video abstract or video byte? How can I further promote my video? What will my video abstract or video byte be used for? A video abstract is a 2-3 minute, professionally animated and narrated synopsis that briefly explains your methods and findings and the contribution of your research to the field. Video abstracts are geared toward a broad, scientifically literate audience. A video byte is a 1-minute overview of your work and how it impacts society, geared towards a lay audience. You can order your video abstract or video byte directly from Research Square, or you can log in to your Author Services account and click on the "Make Video Abstract" button which is present for participating journals. Research Square. They are an organisation composed of writers, voice-over artists, illustrators, and animators with graduate-level scientific training from top US research universities. Your article is matched with a scientific writer who will read your manuscript and write a short script describing your discovery and why it is important. You will be asked to provide feedback and final approval on the script for your video, ensuring that you’re involved with production from beginning to end. The price of a video abstract is $1,500 USD. A video byte is $300 USD. Please keep in mind that additional script and video revisions may result in additional costs. Wiley provides you with 7 promotional tools to help ensure your work gets seen, read, and cited! For more information, please visit our Promotional Toolkit page. You are welcome to share your video abstract or video byte with your institution, at conferences, on your group’s website, via social media, etc. In addition, Research Square will post your video on their social media channels, and Wiley may also do so. For journals enrolled in the video abstracts program, videos will be posted in the journal's Video Abstract Gallery on Wiley Online Library. For more information, visit the video abstracts website.